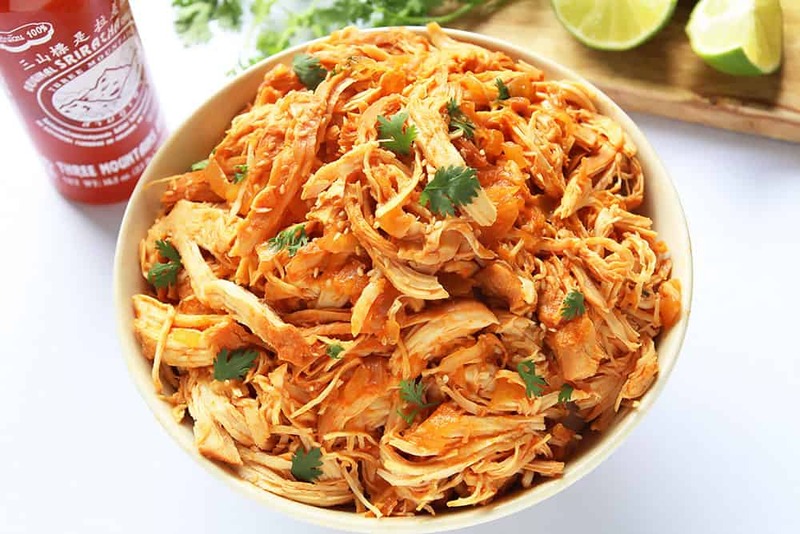 This delicious and simple shredded Honey Sriracha Chicken recipe uses only 5 ingredients. It can be made in the slow cooker or Instant Pot and used in a variety of ways from tacos to pizza topping. I don’t know what has taken me so long, but now I have fallen completely in love with Sriracha hot sauce! Like head over heals, put this stuff on everythaang! Maybe I first needed to be in the country where Sriracha originates from, to be able to discover it for myself. By the way, did you know that this famous hot sauce comes from Thailand? No? I didn’t either until a few weeks ago. Si Racha is a coastal town (and province) a couple hours south of Bangkok and apparently the home of Sriracha sauce. The most common variety in North America is by the Rooster Brand (there is even a documentary about it) and that one is actually made in California. Here in Thailand I have several brands to choose from and one even has a similar bottle as the Rooster Brand, but is called Three Mountains. Although I have never had Rooster Brand Sriracha, I bet it is just as delicious as the Thai kinds that I have tried here. After having used Sriracha as a condiments on things like eggs, soup, fried rice (all of which get better with a little spicy sauce on top), I also wanted to see how it does as cooking sauce. Surprise, surprise… It’s amaahhhzing and makes cooking so easy. There are literally on 5 ingredients listed in the recipe below. 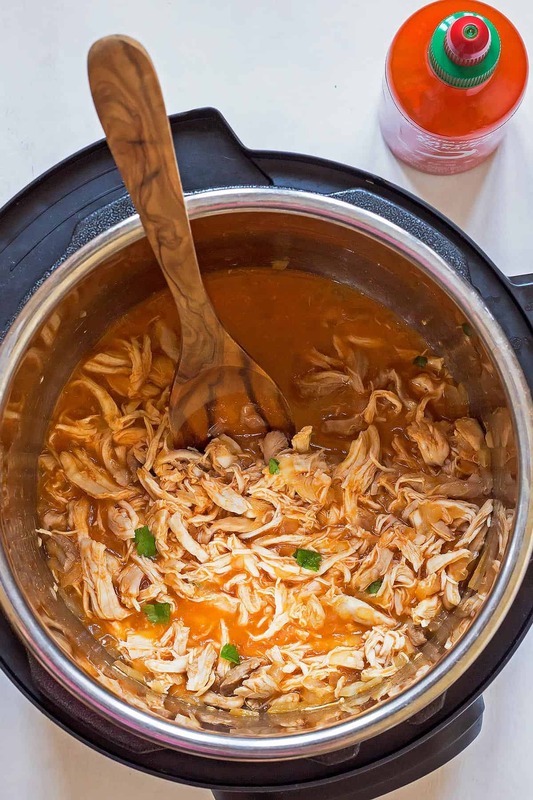 Besides the famous hot sauce not much is needed to make this Crockpot Sriracha Chicken. It’s because Sriracha is made of chili, garlic, salt, vinegar and sugar (nothing else is listed on the ingredients list on my bottle). All of which impart amazing flavor into the chicken as simmers away in the slow cooker. Your house will smell amazing too! When I made this 5 Ingredients Sriracha Chicken Slow Cooker Recipe, Konrad kept coming into the kitchen to inquire what I was making. He could barely wait for the crock pot to finish its work. Once the Honey Sriracha Chicken is all tender, I shred it with 2 forks and add all of the cooking sauce back in. It’s wonderful just as is with a side of steamed rice. 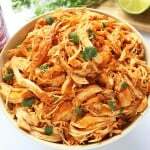 But our favorite way to eat the Sriracha shredded chicken has been in tacos. It’s like an epic culmination of my favorite cuisines. 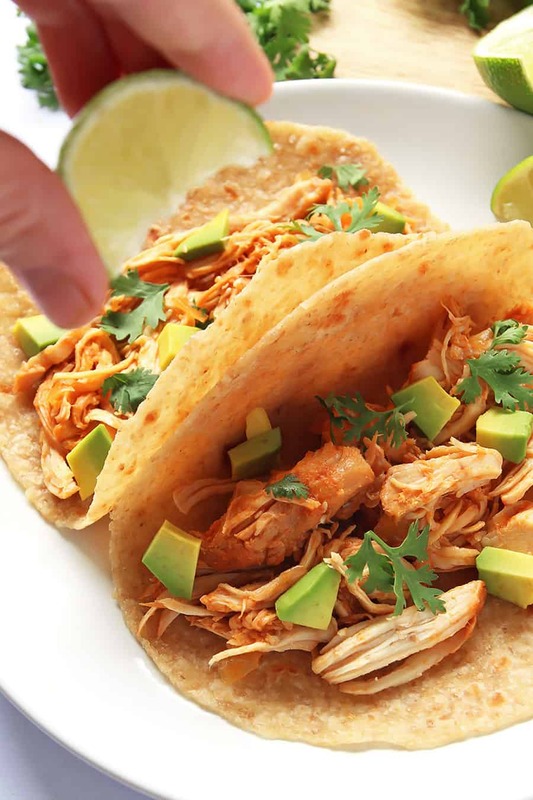 Spicy Thai Sriracha slow cooker chicken wrapped in Mexican whole wheat tacos. Just add your favorite toppings over the meat in the tacos. Avocado and cilantro are really awesome with this. If your kids are more into bite-sized chicken, make them these healthy Paleo Chicken Nuggets. I’ve also tried this recipe in the Instant Pot with great results. Suddenly the 3-8 hours of slow cooking time are replaced by less than 30 minutes. Check out the detailed Instant Pot instructions in the recipe box below. 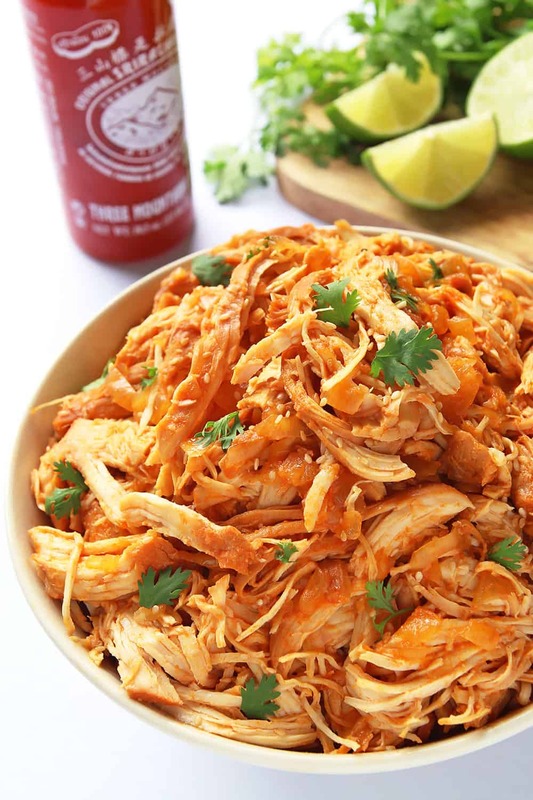 This shredded slow cooker Sriracha chicken recipe uses only 5 ingredients. It can be used in a variety of ways from tacos to pizza topping. Place the chicken breasts and chopped onion in a slow cooker. In a small bowl stir together Sriracha sauce, honey and lime juice. Add to the slow cooker and toss the chicken to coat it evenly with sauce. Cook for 3-4 hours on high (or 6-8 hours on low). Lift the chicken breasts from the slow cooker and shred with 2 forks. Add in as much of the cooking sauce as desired (I like it saucy and will often use all of it). Place all ingredients into the Instant Pot. Toss to coat the chicken with the sauce. Close the lid and set the valve to sealing. Cook the Sriracha chicken on the Manual cooking function for 10 minutes. When the timer is up, turn the sealing valve to venting for Natural Pressure Release (NPR). Using two forks shred the chicken breasts. Season with soy sauce (or Tamari) to taste and use as desired. I was happily surprised at how delicious this turned out! I added about 8 ounces of fresh spinach to the pot when I put the shredded chicken back in and let it wilt in with all of the meat and sauce. I served it on toasted focaccia with pickled matchstick yellow beets for beautiful sandwiches. This easy recipe is a keeper. p.s. I think it would be delicious made using beef too! Ribs or chuck roast – some cut that works well in a slow cooker. I just wanted to let you know that I found this recipe a few months ago, and it is one of my favorite dishes to make. So easy and so delicious… and the leftovers are even better! Thanks so much! This looks great! I see that the recipe yields 4 cups but approximately how many servings would that be/How many tacos would that yield? Oh man…. How spicy is this? 1/2 cup sriracha sounds intimidating!!!! Could you put the chicken in frozen? Hmm… my first thought would be to use brown sugar instead- probably 1/3 to 1/2 cup. Although I haven’t ever done this myself. Hi – looovvveeee Sriracha – my favorite on anything. Only problem is I don’t like honey – is there anything I could substitute??? Could you put all the ingredients in a freezer bag and throw in crockpot at a later time, i wonder? That sounds like a great make-ahead plan. I think it should work just fine! Wow!!!! An awesome receipe, my husband and myself loved it!!! So nice and spicy. Chicken was soooo tender….I added some unsalted cashews…..again so good!!!! Made this for dinner and my picky husband liked it! Its a winner! I am slightly confused. “Add in as much of the cooking sauce as desired (I like it saucy and will often use all of it).” Does this mean you made more sauce and added it to the slow cooker after you shredded or just put the chicken back into the slow cooker with the original amount of sauce? Thanks! Sounds delicious and will be making it tomorrow. Hi Stephanie, sorry for the confusion. I am not making any extra sauce, but usually add all of the cooking liquid after shredding the chicken (outside of the crockpot). Not everyone likes it as saucy, so I leave open how much sauce to add back in. Hope this makes sense? Delicious! Found this on Pinterest and made it tonight as tacos. Very tasty and my sriracha-loving husband approved! This will be a staple for us because it’s so easy. This looks amazingly! My dad marinades EVERYTHING in sriracha! I don’t have lime juice though…. Anything I could substitute? Or coul I add the lime juice later during the cooking? You could try substituting a splash of vinegar (like rice vinegar). But maybe it will be fine without it too? Absolutely LOVE this idea! Am I allowed to add this Yummly.com? Of course, I’d link to your original post but I like using that website/app to keep recipes together, especially when figuring out what to get at the grocery store. Actually, I changed it a little bit. I didn’t have honey but I did have honey BBQ sauce. I added that to my sauce. It came out delicious! “Shred the chicken breasts with 2 forks and add in the cooking sauce.” Does this mean to add MORE sauce? Or just add the chicken back into the crockpot with the existing sauce after you’ve shredded it? Thanks! yes, I shred the chicken separately and add in as much of the cooking liquid/sauce as needed. I like it saucy and will often use almost all of it, but that’s not everyone’s preference. I will update the recipe to make it more clear. I used boneless, skinless chicken breast. I made this last night mainly because I had all the ingredients and wanted something easy. I served it with brown rice. It was good and the chicken was very tender, but the flavor was off just a little…maybe too vinegary? It think it really needs something else with it, like maybe avocado, beans, etc. Love slow cooker chicken! It is also so comforting, homely and hearty. Nice addition of sriracha too – I love the hot sauce and cannot get enough of it. I use the slow cooker year round but it’s also perfect for anyone making comfort food as we move into cooler seasons. Wait, you’re in Thailand?! How awesome is that?! We were there 3 years ago, and I fell completely in love with Thai food…I wish you could mail me a big bowl of Tom Kha Gai! Love the looks of this chicken, so simple and easy, and looks absolutely delicious! Yes, we fell in love with SE Asia and Thailand especially on pre-baby travels. We’ve now been here 2 months. Challenging at times but truly amazing!